Fores New Idles in Skyrim - FNIS Need this for animations to work. SKSE Need for scripts to work. Get the classic build. No permissions needed to use my any of my work and credits are also optional. Fixed issue with missing behavior file. Add spear weapons and animations. This mod adds 8 spear weapons and the animation to go with it. These are of the sword type and uses the one-handed perk tree. Both the player and NPCs can use the spears along with animations. The spears can be crafted and can be found on enemies you encounter. 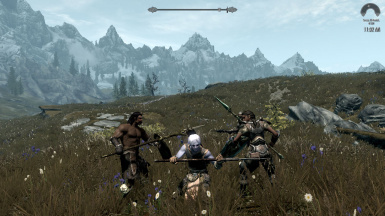 Each spear has varied stats, for example the weak Iron Spear is fast but shorter ranged while the stronger Ebony Spear is slower but greater ranged. For now this only works for 3rd person. Although I have a few 1st person animations made, I don't have a way to make use of it as FNIS does not support it. I'm looking at other methods to eventually include 1st persons as well. Spear Grip Mechanic: When using the spear with a shield or off-hand weapon the one-handed animation will be used. If the left hand is unequipped and empty then both hands will grip the spear and the two-handed animation will be used. While in this pseudo two-handed mode you gain an attack damage boost of 20%. Using magic on the left hand is considered empty, both hands grip the spear until you cast a spell. Unique Addition: When block-bashing in 2-handed mode the reach is reduced to 1.0 same as a sword reach. This also applies to the sneak power attack "Plunging Attack" it gets the reach reduced but also gains a boost of 10% to attack damage. Install like normal, manually or with a mod manager(recomended). To uninstall first unequip the spear to reset your character to using the vanilla animations then save the game and exit. Uninstall the mod from the game then update FNIS again before hopping back into the saved game. If you find yourself already in a T pose or bugged animations because of uninstalling the mod without resetting the animation to vanilla then you can reinstall the mod and perform the steps above. - While using magic on the left hand and in the 2-handed mode the strafe left and right animations will not function properly. That is because FNIS doesn't support these two animations even though they are included. - Additional spear animations are add in by using FNIS to patch the behavior files. - SKSE allows the the scripts more functionality and we can apply the animations to override the standard animations when a spear is equipped. - A quest applies an Alias to the Player or NPCs who has a spear equipped which attaches said script onto them that controls the animations. - When in 2-handed mode, a perk applies damage boost to spears, and removed when the spear is unequipped. - For more in-depth details you can contact me. - May work alongside other spear animation mods without conflicts. Only spears from this mod will use this mod's animations. - Will conflict with other animation mods that does the same thing. BouBoule201288 - Inspirations for my mod. NickaNak - Being the best mentor ever! Bubbajones_ya - For the Blender setup, none of my animations could have been made without this.